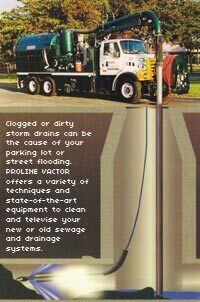 PROLINE VACTOR's professional cleaning services can quickly eliminate your flooding problems by cleaning your clogged or dirty storm drains. Our 11-vehicle fleet is state-of-the-art and our service is prompt and reliable. We have been serving Florida's businesses, contractors, developers and municipalities since 1998 with one of the largest fleets of its kind in the state. We specialize in cleaning large pipes and our latest equipment can handle pipes up to 102 inches in diameter. In addition to solving your drainage problems with our cleaning services, PROLINE VACTOR offers a full range of services to inspect and repair pipelines. Our telespection trucks are equipped with mini-camera systems to provide video inspection of underground pipelines. We diagnose and repair minor troublespots before they become costly, major problems. Hydro excavation is becoming one of PROLINE VACTOR's most in-demand services for major excavation jobs. From fast, efficient excavating beneath beach-front mansions under renovation, to locating underground gas, electrical, or telephone lines, we have the best technology for the job. High-pressure water and vacuuming are used in a system that is faster and much less expensive than old fashioned digging. And underground lines are not damaged with this process. Whatever your application, we pride ourselves on providing superior service!